After a little over a year in our “new” house, we found ourselves with a broken dishwasher, barely working cooktop, and the wonderful wall oven that would not even fit my cookie sheets. Time to rip apart the kitchen! Once we realized that the majority of our budget had to go toward appliances, we got creative. Our biggest savings…reusing all our cabinets. Even though they were not my style, they were in good shape (except the sink cabinet, which had to be replaced due to a nasty leak). Since our plan was to reconfigure the kitchen, we had to come up with a new layout using our existing cabinets. Sort of like real world Jenga, and it worked! We took them all down and reused them in completely different ways. The set above was moved from the corner to the island. The hardest part of this operation is finding the color you want. I just love those $3 samples from Home Depot. They are an inexpensive way to play with paint colors. We had many versions sitting all over our downstairs until we decided this was the combo we liked best. The winning color is a mix of Behr Ultra Pencil Point from Home Depot and Valspar Glaze from Lowe’s. 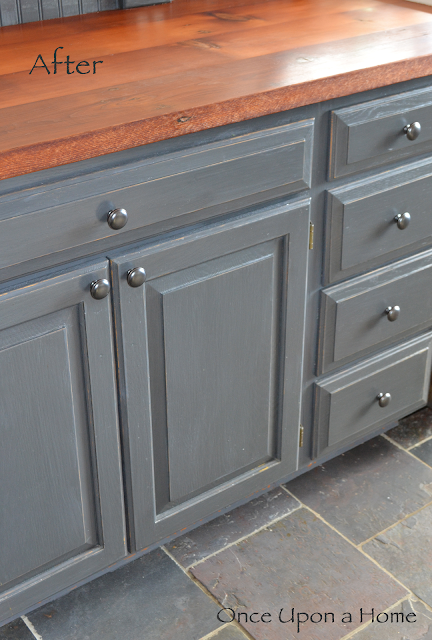 The cabinets were then slightly distressed with sandpaper and finished with a Flat Polyurethane. Looked all over for knobs…found these at Target. They are perfect, with a pewter look, and a great price! 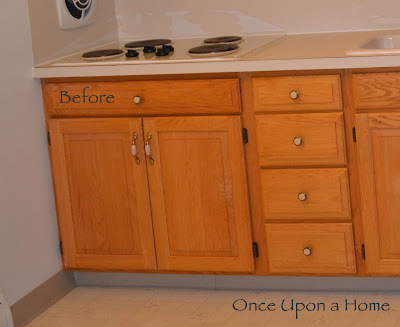 This entry was posted in In the Kitchen and tagged budget kitchen, painted kitchen cabinets on January 31, 2013 by onceuponatimecreation. Giving a contemporary window a vintage look can be quite a challenge. We love the natural light this window provides, but wanted to soften the look a bit. It took a while to find fabric we liked, but finally found this great stripe called Belle Isle Stripe (Dove) from Fabric.com. The off-white lower panels are from Ikea and have a beautiful natural weave. Ikea has the best neutral curtains for a great price. The long panels were cut and hemmed to fit. Right now they are tied with simple twine. Think this is temporary…maybe change to a burlap ribbon??? 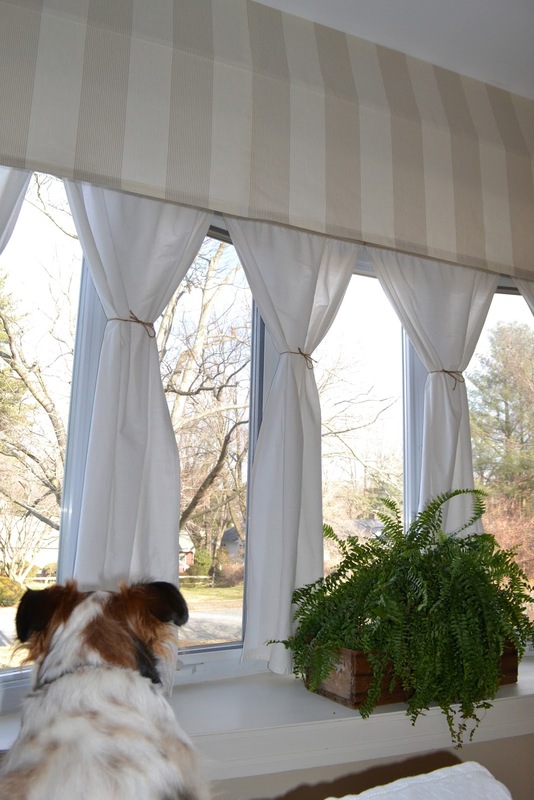 This peaceful cafe stye valance is easily created using two long boards. The one at the ceiling is a 1×2 and the fabric is stapled on. The lower board is a 1×4 and the fabric drapes over it. Just love how the valance reaches the ceiling. This is our pup’s favorite spot…he can watch the whole neighborhood. We call it DogTV. This entry was posted in Windows and tagged bay window, bow window, cafe valance on January 25, 2013 by onceuponatimecreation. Jars, Jars, and more Jars! Putting open shelving in our new kitchen took much convincing with my better half, but now he loves it (and so do I). These jarred staples are used everyday. The airtight lids keep everything super fresh and it is easy to see when we are running low. The top shelf houses our baking needs…flour, sugar, and oatmeal. These are cracker jars with twist off lids. They are sold at Bed, Bath and Beyond and Target. The next shelf changes constantly. Now showing…popcorn, marshmallows, walnuts, quinoa, beans, etc. These are all wide mouth Ball jars, pint or quart size. They are sold at Walmart by the case, but they can also be found everywhere for a little less at the end of the summer (canning season). The third shelf usually holds pancake mix, hot chocolate, dog biscuits, and crackers. These are also cracker jars, just in a different size. The large white containers are great because they hold an entire bag of chips or pretzels…the kids love this shelf and everything stays fresh. These came from Ikea a number of years ago, but anything similar will work. Just make sure the lid has an airtight seal. The fun chalkboard labels are from Staples. 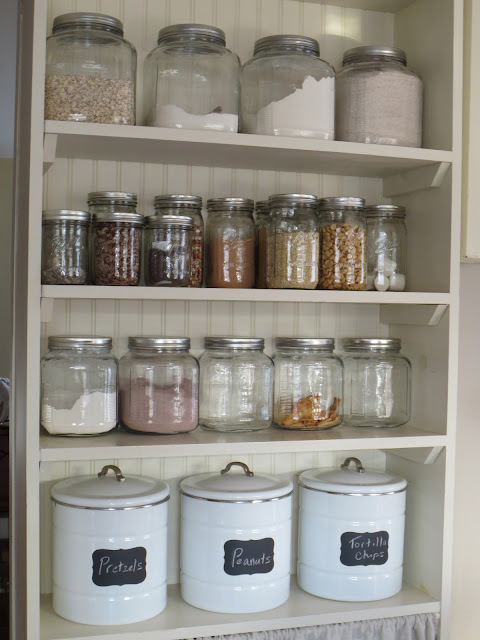 Give open shelving a try to create a vintage feel in your kitchen! This entry was posted in In the Kitchen, Mason Jars and tagged cracker jars, mason jars, open kitchen shelving, pantry organization on January 23, 2013 by onceuponatimecreation.